Poet Michael Wasson: I see it, but not very well. It’s pretty blurry. But I think it has a lot to do with a hunger for discovering a mystery. Wanting to move into a fathom to find something that might change you. How the more we try to unearth an initial ‘meaning,’ the wider the hole we’ve dug continues to get. I was so looking forward to Amy’s response. To realize what was guiding her was only my gapped little scribble. It’s humbling. How her work’s life met mine only through our ways of seeing the world & thereby finding a common moment of stability—in one palpable thing being ‘held up’ by something unseeable, something seemingly unpalpable. Michael Wasson: I don’t know if it truly ‘fits’ as much as it has always been a part of my little ‘creative’ life. A hand. Or a shoulder. A jawbone. I never asked how my arm fits to my body. It’s just my arm. But many of our ‘creative’ lives somehow involve language being a conversation between the unsayable and the transformative. I like opening possibilities. So when nimipuutímt blossoms a smidge out from the page, I let it be. Just let it ache and breathe and be alive there in its beautiful little textual and/or sonic breach. For me, maybe that’s how it fits. Like a tiny fracture from a world somewhere inside me. Revealing brief layers to a life I’ve been given. Like the origins of my arm was all my ancestors deciding, okay this is how his arm should be. Artist Amy Meissner: This poem reminded me of this piece of textile art I completed in 2015. “Reliquary #8: Scroll,” is from the Reliquary Series, which is an exploration of found objects, history, memory and loss. It’s anchored by the remnants of two dock bollards found on an Alaskan beach, with the scroll form acting as a vessel for the valueless found objects embedded within its length—stones, shell, bone, abandoned embroidery and discarded cloth. It is a reliquary for the combined narrative of these items, a romance with the fragment, an act of revering a collection of things which are normally overlooked. This poem spoke to me in a similar way. Poet Michael Wasson: I wonder that myself! Both in my tribal language and the language I use to navigate my current life (Japanese), assumed context plays a major role in what we mean and what we leave out. There’s so much we don’t need to say because it’s there between us. And with white space as an indication of the unknown, and as soon as I broke the first nimipuutímt word in two, I didn’t know whether a ghost was appearing or simply a whisper. It distorted a single view into several views. Almost kaleidoscopic. Who did these sounds belong to? So I guess the poem wanted to challenge how I am to see the ghosts of my life, whether paternal, ancestral, mythic, or historical. The context of the speaker’s body is maybe what made the poem split itself in order to see. Somewhere, I’m there as a nimíipuu body. But also, everyone & no one is there. Only a body and another. But who’s to say? Poet Michael Wasson: I was talking to a nurse and a vice principal a little while ago at a dinner party about Murakami’s 1Q84 and his Hard-Boiled Wonderland and the End of the World. Also, I’ve been reading Eduardo C. Corral’s Slow Lightning and Vuong’s Night Sky with Exit Wounds a bajillion times over. And I started reading Milnes’ Winnie-the-Pooh in Japanese recently. It’s so adorable. Artist Amy Meissner: I’m currently reading Labor of Love: The Invention of Dating by Moira Weigel—an examination of a century of dating and how this shaped our ability/inability to relate to our partners or even find partners due to all the rules and social cues laid out for women. I don’t know what prompted me to read this, but it’s fascinating. Artist Amy Meissner: The Anchorage Museum at Rasmuson Center recently had a fabulous exhibition called “View Up Here: the Arctic at the Center of the World,” an international contemporary art exhibition with a focus on the Arctic through film, photography, installations and sculpture. 14 artists highlighted “Arctic cultures, landscapes, scientific research and visions of the future” with their work. Outstanding. Poet Michael Wasson: I recently had a piece at The Rumpus, and I was asked about an accompanying art piece. My first reaction was: Jaune Quick-to-See Smith. Her work is wonderful and makes me feel so much about the different gazes and histories upon the indigenous body. Also Sarah Biscarra Dilley, whose work is powerful. And I got the chance to see Hideaki Hamada’s photography this year in Nagoya at the Lights Gallery with my friend. So good. Note: Broadsided has Vectors everywhere, so it’s only fair that we offer some poems in languages other than English. This is our fourth translation feature. Guest Editor Joan Naviyuk Kane is a Whiting Award winner and author of The Cormorant Hunter’s Wife, Hyperboreal, The Straits, and Milk Black Carbon. 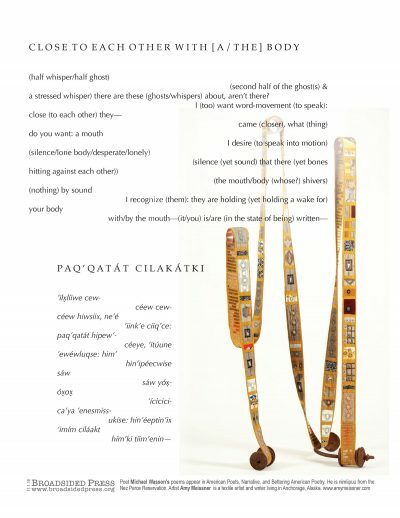 Her poem “Mammaraq (Innuŋŋuuraq)” / “The Doll (A Pretend Person)” was featured in our 2014 Translation Feature. Poet Michael Wasson is the author of This American Ghost (YesYes Books, 2017), winner of the Vinyl 45 Chapbook Contest. His poems appear in American Poets, Narrative, Denver Quarterly, Passages North, and Bettering American Poetry. He is nimíipuu from the Nez Perce Reservation and lives abroad. Poet Michael Wasson vectorizing on an island ferry in southwestern Japan. Artist Amy Meissner, vectorizing in the final days of an Alaskan fall.